It is inevitable that Greece will re-default – the only question is if they will remain in the EUR once they have re-defaulted. The IMF’s Blanchard just posted to the fund’s blog on the lessons from Latvia, which suggests that the IMF are pulling for a default-and-stay outcome. To recap, Latvia defaulted and went into a programme in 2008, but retained their peg to the EUR. That Blanchard is talking about staying in following a default suggests the fund is preparing for life after re-default in Greece. The key message is that default and recovery while holding a peg to the EUR is possible. Blanchard is not hopeful that the periphery can perform as well as Latvia, as peripheral markets are less flexible. His prescription is therefore reform to increase the flexibility of wages and prices. I doubt that the Greek experience is going to be as kind as the Latvian case. I see two risks: Greece leaving the EUR by choice, and contagion via Sov bond holdings. Greece eventually leaving the EUR by choice seems the most likely ultimate outcome – but it is unlikely to occur this month. It seems a likely ultimate outcome as it is the surest way to improve employment prospects for young men – the alternative micro-economic reforms do not seem socially possible. A Greek exit is likely to cause a crisis in Europe, as the future of the EUR would be doubted. The most likely case is that Greece remains in the EUR for now. Even in this case, re-default stress may spread via Sov bond holdings. I suspect that this is a good part of the reason the Spanish bailout was arranged last weekend. When Greece re-defaults, further in declines in the value of peripheral Sov bonds are likely. European banks own a lot of these bonds, so they will make large mark-to-market losses as this occurs. For the most part, only small amounts of capital are reserved against these Sov bonds holdings (as they are ‘risk free’ according to regulations). Thus, a sharp decline in bond prices may wipe out the capital of some European banks, and spread the trouble (this is a key contagion mechanism). In my mind, this is the key difference to Latvia – the precedent effect will make it much more difficult to stop the contagion via rational re-vals in European Sovereign Bond markets. This has happened before. It was Sovereign bonds that started the fire in Argentina (see here for example), and it is the key risk in the European case. After all, it is sovereign bonds that were mis-priced in the boom – and following credit booms it is typically the previously mis-priced assets that cause the trouble. 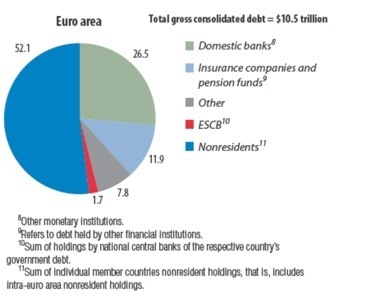 According to the IMF, European banks have ~2.75tn of Sovereign bonds – a 20% drop ought to be more than sufficient to damage the solvency of some banks. The fix – they need much more capital.